Keto Loaded Baked Avocado Eggs are a genius way to eat a filling, keto-friendly breakfast that is high in flavor and low in carbs. 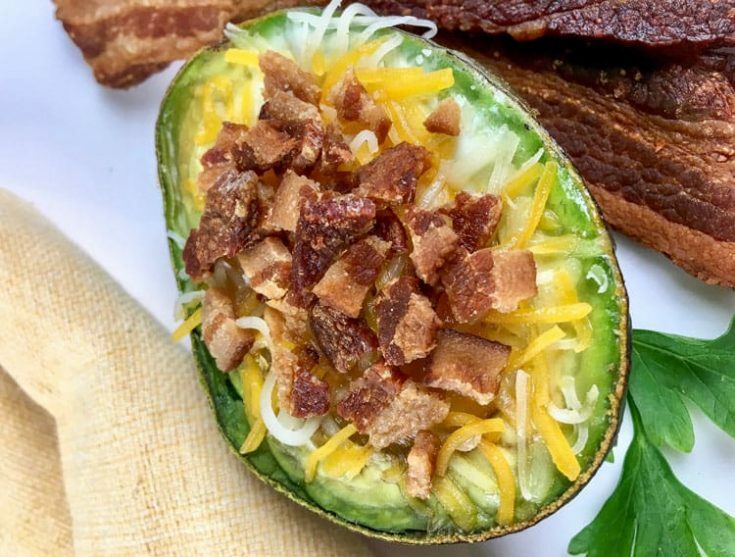 If you’ve never had an egg baked in an avocado, stop everything you’re doing and make this recipe right now! Even if you’re not on the keto diet (a diet that focuses on eating lots of fat and not a lot of carbs), you will love these Keto Loaded Baked Avocado Eggs. In fact, everyone I know who has tried these raves about them. I turned a friend on to them and she told me she ate one for breakfast every day for a week! Keto Loaded Baked Avocado Eggs are super easy to make (especially when you use the tips later in this post), are ready in less than 30 minutes, and contain only 2.2 grams of net carbs per serving! Step #1: Preheat oven to 350° F and get out a muffin tin. Step #2: Remove pits from avocados by cutting them in half lengthwise. Using a spoon, carefully remove a small amount of the avocado flesh around the pit to give the egg more space. Step #3: Into a small bowl, crack one egg. Transfer this carefully to one of the avocado halves. Place the avocado on the muffin tin and repeat the process for all four halves. Season each half with sea salt and pepper to taste. Step #4: Place into pre-heated oven and bake for 20-25 minutes (or until eggs are cooked to your desired consistency). Step #5: Remove baked avocados from oven. Top with cheese and bacon. If desired, garnish with sliced green onions or chives. Serve immediately. Enjoy! Tip #1: Use large avocados (but not necessarily Florida avocados). If you’re not an avocado connoisseur, you may not know the difference between Haas avocados and Florida avocados, so let me elaborate. Haas avocados are smaller than Florida avocados and have a thick, dark skin. Florida avocados are pretty big and have a thinner, lighter skin (more of a light green). Florida avocados have less fat in them than Haas avocados… not exactly the goal for a keto diet! Haas avocados, despite being smaller than Florida avocados, come in several sizes. You want to go for a larger-sized Haas avocado but probably not something as large as a Florida avocado. Tip #3: Crack the egg into a small bowl before using it. Doing so will give you better control of it than if you cracked it directly into the avocado. Tip #4: Scoop out a bit of the avocado to make room for the egg. Make sure to scoop out a bit of the avocado flesh with a spoon before adding the egg so the egg doesn’t overflow. 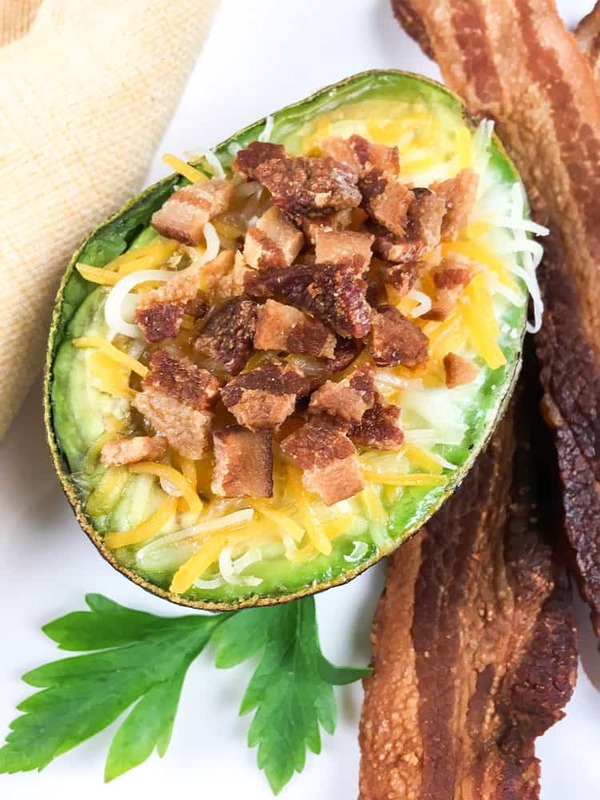 Don’t throw away this extra avocado! Mix it with some salt and pepper and use it on top of a salad, your baked avocados, etc. Tip #5: Cook your Keto Loaded Baked Avocado Eggs in a muffin tin, not on a flat baking sheet. As if these baked avocados weren’t genius enough, this tip will ensure baking perfection! By positioning them over the holes of a muffin tin, your baked avocados won’t tip over while baking. I hope you like these awesome baked avocado eggs. If you want a few more keto recipes, try a few of our favorites like Easy Weeknight Keto Pizza with Pepperoni and Keto Shrimp Recipe – Lemon Garlic Shrimp! These Keto Loaded Baked Avocado Eggs are divine! They're so flavorful and filling. Preheat oven to 350° F and get out a muffin tin. Remove pits from avocados by cutting them in half lengthwise. Using a spoon, carefully remove a small amount of the avocado flesh around the pit to give the egg more space. Into a small bowl, crack one egg. Transfer this carefully to one of the avocado halves. Place the avocado on the muffin tin and repeat the process for all four halves. Season each half with salt and pepper to taste. Place into pre-heated oven and bake for 20-25 minutes (or until eggs are cooked to your desired consistency). Remove baked avocados from oven. Top with cheese and bacon. If desired, garnish with sliced green onions or chives. Serve immediately.